Description: Desert Breaker was an exclusive arcade commando style game released by SEGA in 1992. 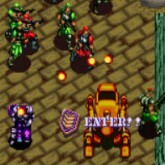 Choose from 3 characters all armed with big guns and grenades. Your commander will give you objectives to follow. Scout through missions and destroy everything in your site. The gameplay is cool because characters can rush move to avoid being hit, it's kind of unique and cool!